Scopri alcuni dei punti di maggiore interesse di Dubai durante questo tour di 7 ore. Esplora le gallerie d'arte e i numerosi souk del quartiere di Bastakiya insieme al labirinto di souk e i bazar nelle vicinanze. 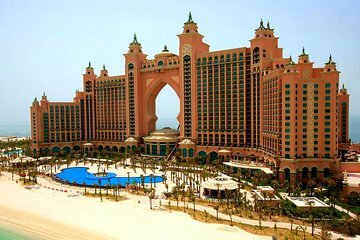 Potrai inoltre visitare Jumeirah per esplorare la Palm Island, l'hotel Burj Al Arab, la Jumeirah Mosque e la Spiaggia di Jumeirah. Completa il tour con un salto al Centro commerciale degli Emirati, l'imponente Burj Khalifa e molto altro ancora nel centro della città. La gita include una guida e il servizio di prelievo da e verso l'hotel. Questo tour inizia dopo pranzo, lasciando la tua mattinata libera ideale per chi arriva su un volo del mattino. Too much time spent at the beginning at boring stops. The tour starts around 1pm and ends about 8:30 pm, later than we expected. Exhausted at the end, but very nice overview of major sites. Excellent tour. It is perfect to do at the beginning of your stay, so later you decide in which places you would like to expend more time, visit again, etc. The guide was excellent, we have time for ourselves in all the stops, and he was explaining while we travel from one place to the other lot of interesting things about Dubai's history, culture, way of life, etc. Excellent. The sales pitch for the 24 carat gold rugs was a drag. Otherwise the quality and delivery of tour was very good, broad and useful coverage of the present day Dubai structure, administration, racial integration and makeup, as much as its history which was, to us, as it should be. A comprehensive tour of the main sites in Dubai with the irrepressible guide Imran Shirazi. He was very knowledgeable and presented the information in an entertaining way. We visited the old houses of Dubai which are now being preserved, Dubai museum, The Gold and Herb and Spices Souks, The Dubai Mall, The Fountains and many other places of interest. The tour lasted for 7 hours with a hotel pick-up between 12.30/1pm and drop off back to your hotel. There was also a light lunch and drink provided. Good value and ideal for a short stop visitor like us where we stayed for just one night. There was issues at the start as the tour stated ‘hotel pick up’ which was confirmed the day before however no one turned up and our concierge had to contact the tour to pick us up! End of the tour the same and we ended up paying for a taxi! The tour itself is ok -I liked the boat ride! You get to know the best highlights of dubai during this tour. the tour leader Azizi was very good! The tour was complete and took in more then what we expected. The tour guide was VERY knowledgeable and had answers to any questions that were asked of him. This tour is highly recommended for those who want to see the best of Dubai in one day. Amazing tour of the city. Our Tour Guide, Aziz, was GREAT!! He was very knowledgeable of all the sites he showed us. We were picked up on time. Guide was friendly and more obliging however if you lagged behind you got left. Overall the tour was too rushed, had just enough time on most stops to jump off the bus take a pic and hop back on. Thought we were going in to look at a Palace now a Hotel but it was a quick spin up the drive and out! Spent more time in Souks and places where they want you to spend money than other places of interest. The dancing fountains were a let down seen better in NZ . Crazy city with some fabulous architecture but a better tour than the Abu Dhabi tour.